The course focuses on micro-controller basics, programming languages and tools, control software structures and programming techniques and applications. After attending this course the participant will acquire good understanding and skills required for embedded system programming. 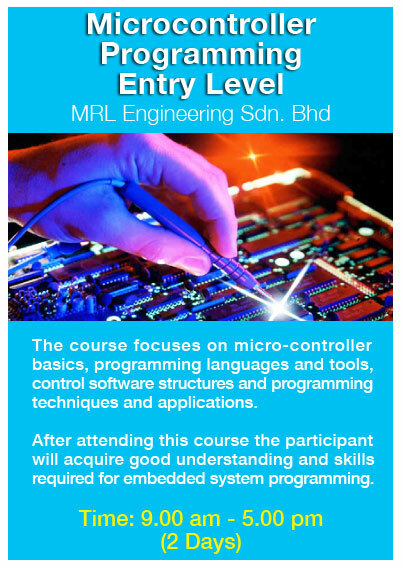 During the practical session, participants will have opportunities to familiarise themselves with the general knowledge on products and software’s developed by MRL Engineering in embedded system. If any participant is unable to attend course due to some problem, is given the flexibility to change starting date without extra cost, One have to inform with the new starting date at least 3 days in advance. 75% refund will be made for cancellations received in writing at least 14 days before event. A 50% of full fee will be refund if cancellation is made 7 days prior to the event.